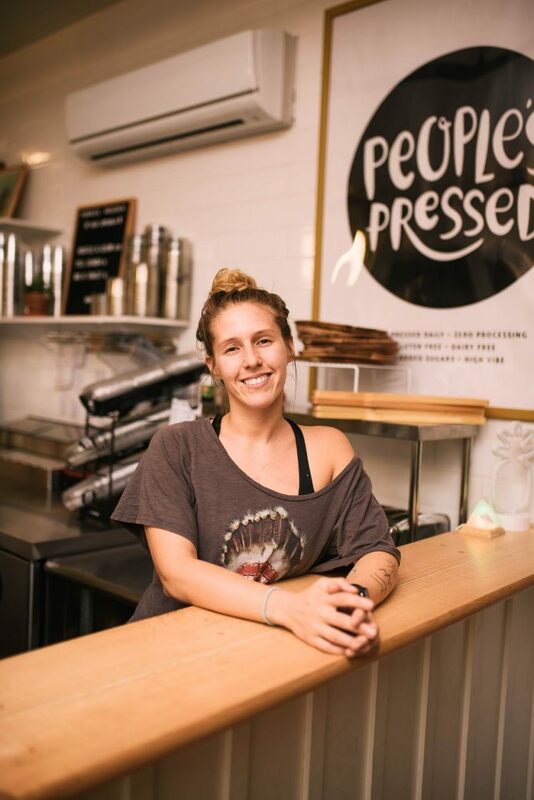 Meet Amanda Desrosiers, the 29-year-old founder, and owner of People’s Pressed. When Amanda was in high school she considered herself overweight and when she moved out of the house to go to college in Boston, she began focusing on how she ate and getting active. This journey not only led her into a bachelor’s degree in Graphic Design but a passion for rock climbing. While traveling and rock climbing across the country, she encountered several juice bars, something that she didn’t use to back here in New Bedford. She had been making juices at home, but it was on her journeys that she discovered the cold press method, where no heat or air is used to pull the juices from the fruits and vegetables. This process keeps the most amounts of nutrients and enzymes in the juice, making it healthier than other processes. The process interested her and she decided that she wanted to open her own Juice Bar in New Bedford. While still working a full-time job, Amanda joined the Southcoast E-For-All to become educated on starting and running a business, where she worked with a mentor from the community and her cohorts in developing and executing their business plans. In Spring of 2018, she opened People’s Pressed, a juice bar and wellness hub in downtown New Bedford. Her hope is to be able to cultivate a community of people focused on eating and living clean, healthy lives.